An unofficial fansite for Canada's first professional rugby league side, featuring news, information, and match reports. Following the journey from League 1 to Super League. Toronto Wolfpack aim to play an exciting expansive form of rugby league, but today their hosts initially caught them off-guard with their own inventive play. 1,128 turned up at Cougar Park to see Keighley’s game against rugby league’s new boys, and those who spent this sunny afternoon watching League 1 rugby weren’t disappointed. An error in the opening minute gave an early impression that this would be another easy win for Toronto, but Adam Sidlow dropped the ball over the line for the Wolfpack in an unexpected first attack. Keighley came back well, though, and forced a repeat set on the opposition line shortly after. It turned into an even, somewhat error strewn game as both sides tried things in attack. Matty Beharrell’s kicking game was key to the home side’s good field position, and his punt to the corner was almost collected by Andy Gabriel. Toronto drew first blood when Jonny Pownall scored on the overlap on the right wing, but Craig Hall was unable to convert from the touchline. He was given another tough conversion when the Wolfpack crossed again when Liam Kay dove at full stretch to touch down a clever Blake Wallace grubber into the corner. Hall missed again, making the score 8-0. The Cougars got the try their play deserved when Will Milner broke through the line, offloading to Joshua Lynham who was on hand to cross by the posts. Beharrell took control of the game for the rest of the half, converting Lynham’s try, knocking over a penalty, and adding a drop goal before the half-time hooter to make the scores 9-8 in Keighley’s favour. Keighley came out for the second half and scored out of nowhere from their own kick-off. Kay and Wallace made a mess of receiving the kick, and Brad Nicholson pounced on the loose ball to claim four points. Toronto looked out of ideas and needed to go back to the basics, doing the simple things well in order to take control of the game. Bob Beswick did just that. Winning a penalty with a scamper from dummy-half before organising his team as they went the full length of the pitch. Wallace added the final touch of class with some fancy footwork to break the line and cross under the posts. Hall kicked his first conversion of the game and Toronto were back in it. Their individual class then began to tell when Pownall broke through some poor Keighley defence before going the length of the field to score. Errors crept into Keighley’s game and Hall was able to pounce on a loose offload to kick through and score, adding the extras too. Keighley looked out of gas and out of ideas, which could be a familiar story when it comes to Toronto’s opposition this season. Amateur sides playing against a professional outfit will always struggle for fitness late in games, and this match was an example of that. Hall put Pownall in for his hat-trick with a great pass after drawing three defenders, but again failed to convert from the touchline. With around 10-minutes to go Keighley came up with one of the best passing moves of the game out of nowhere to make the scores 30-21. It was a second wind, and a deserved try for Beharrell. The Cougars played expansive rugby until the end, but errors prevented further progress. Two more from Sidlow and an Andrew Dixon try added to the scoreboard late on to make the final score 21-48. It was another win for Toronto, but the performance of their opposition will have taught them a lot about the areas where they need to improve. As they look set to take League 1 by storm it will be important that the Wolfpack take lessons from the moments their opponents are on top. Today was also their first glimpse of summer rugby in the UK as sun shone down on West Yorkshire, and the 100s in attendance will have enjoyed the performances of both sides. Toronto Director of Rugby Brian Noble gave man of the match to Matty Beharrell, and after the scrum-half's stand-out performance, it was fully deserved despite being on the losing side. From London, the South East, and a new shiny artificial pitch, to the North West, Whitehaven, a rugby heartland. Following this team isn't just following a club, it's supporting the game, and along the journey Toronto Wolfpack have planned you'll see all it has to offer. Toronto Wolfpack’s journey may have started in the rugby league heartlands of Yorkshire, but in their first ever game in the league they look to climb took place in unfamiliar RL territory. Rugby league has struggled to exist in London, and many clubs have formed and failed and come and gone. There are some similarities between the attempts to establish the game in London and the current Toronto project, but there are also many differences, which will hopefully come to light as the Wolfpack story unfolds. But it’s here, in the shadows of soccer and rugby union, that the Canadian side’s journey begins, on the artificial turf of the White Hart Lane Community Sports Centre. The very name of the stadium hints at soccer, with Tottenham Hotspur just down the road from this ground which is also more conveniently known as New River Stadium. It’s a far cry from the Siddal mud. The mud up there, between Halifax and Huddersfield is proper rugby league mud, and down here they don’t even entertain it. However, the artificial pitch suits the wolfpack down to the ground. For the first time they’re able to display the other side of their game. The silky skills, quick ball handling, and superior physical fitness which should see them walk this division. That’s not to diminish the contributions of the London Skolars and the other teams in the league who fall way behind when it comes to resources, but stand high when it comes to giving rugby league a platform. They are also providing a platform for the Toronto Wolfpack. Without these teams there is no league structure, no path to Super League, and no way in for an ambitious side with enviable resources. Nevertheless, it was an easy victory for Toronto in their first game, as they an out 76-0 winners. Craig Hall scored the side’s first try in the league, while Fuifui Moimoi grabbed a hat-trick. Head coach Paul Rowley had words of warning for future opponents regarding the Tongan-born New Zealand international. “It was the perfect start. We reminded people that we are not a bad side,” added Rowley. The nature of this quest means that anything could be around the corner, and what came next was something completely different. A trip up to Whitehaven brought a new test, and will have made the Toronto outfit thankful that they’d already passed a similar test at Siddal. On England’s north-west coast, Whitehaven and west Cumbria is a hotbed of amateur rugby league. It’s a massively underappreciated area in the game and is up there with Lancashire and Yorkshire when it comes to the heartlands of rugby league. The area should have at least one Super League club, and there is a case to say that Whitehaven and their neighbours Workington should have been more involved in the top league by now. Toronto Wolfpack Director of Rugby Brian Noble commented prior to the game that he’s always been an advocate of a Cumbrian based Super League side, but he finds his team facing them here in League 1. The conditions were damp, and the pitch was a stark contrast to the 4G artificial turf down in London. But the result was no different. Whitehaven spent last season in the Championship and put up a good fight as expected, but it was a comfortable 24-10 win for Toronto. “People talk about our attack, but defensively, we’re pretty good. Whitehaven scored after two kicks and that’s all. We’re more than happy. We were ruthless from start to finish and by far the better team,” summarised Rowley. 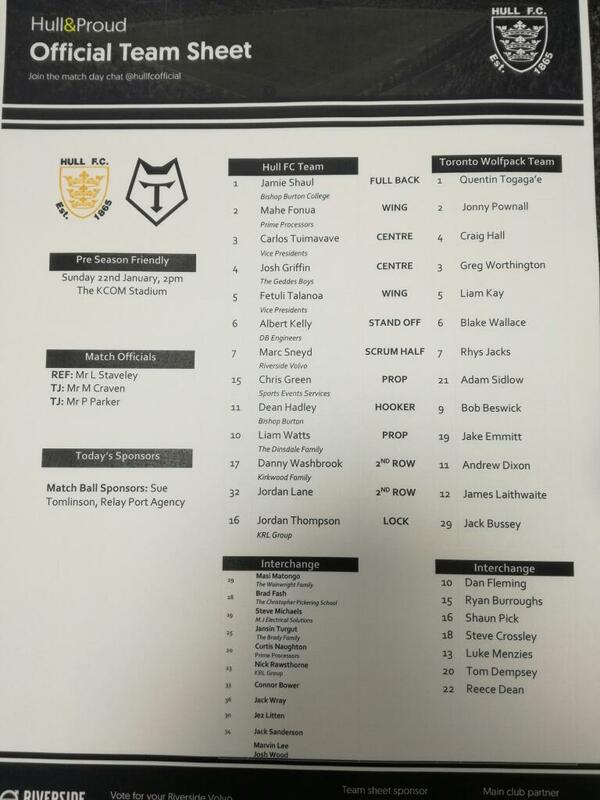 This was a far cry from Toronto Wolfpack’s glamour friendly against Super League side Hull FC back in January. That may have been the new club’s first ever game, but this Challenge Cup Third Round tie was their first competitive match and amateur club Siddal made sure the Canadian side know what faces them as they attempt to rise through the leagues. Siddal’s home ground of Chevinedge, just outside Halifax, is the type of arena the Wolfpack will have to get used to as they begin their rugby league journey. Stages like this are where the seeds of rugby league’s future are sown, and the Toronto club will lay their own foundations at grounds like this in the weeks and months to come. The grass covering lasted about as long as the players tempers, as a skirmish broke out just minutes into the game and the pitch quickly turned to mud. The National Conference League champions defeated Pilkington Recs in the previous round, scoring 34 unanswered points after initially going behind 10-0. They began this game in similarly impressive fashion, and the sides looked evenly matched early on with the pitch acting as a leveller. The home team’s defence held both Blake Wallace and Bob Beswick close to the line in an early showing of the solid defending to come throughout the game. By this time those watching on the BBC’s live stream — broadcast worldwide — were viewing the game through a drizzle spotted lens, but viewers were still able to see Siddal’s defence hold out for a second time as Toronto enjoyed multiple sets in opposition territory but couldn’t break through. Blake Wallace came close again but was held up over the line as Toronto struggled to get the ball out wide quickly in the wet conditions. The first points of the game came when Jack Bussey was penalised for a high tackle and the boot of Siddal’s Gareth Blackburn navigated the blustery conditions to kick his side into a 2-0 lead. Going behind shocked the Wolfpack into action, and they crossed though Ryan Burroughs as they were finally able to get the ball out wide quickly and cleanly. This try gave the visitors a 4-2 lead at half time. The BBC cameraman took the opportunity to clean his lens at half-time but the clarity didn’t last for long as the drizzle continued to blow around the ground. Siddal started the second half well and were eventually rewarded with a try. They’d forced a second set as the Wolfpack had to drop out from beneath the sticks, and the amateur wide were able to score through George Ambler who got on the end of Shaun Garrod’s kick into the in goal area. By this time both teams were playing in black, as Siddal’s Halifax-esque blue and white kits had become caked in mud, and the white numbers on the back of Toronto’s shirts were illegible. It was a real test for the new professional club from across the Atlantic, and they had to dig deep in order to come out on top in this war of attrition. They scored their second try of the game when Greg Worthington crossed in the far corner, and just over ten minutes later they were able to put daylight between them and their opposition for the first time when substitute Adam Sidlow slid over beside the posts. Craig Hall added the extras as the first converted try of the game made the score 14-6 to the visitors. Though this was the final score, the drama didn’t end there as Fuifui Moimoi was shown a red card for a high tackle on Ian Davies. It was an aggressive one-handed blow to the head from the Tongan, and the red card, which shone in the air amongst all the mud and rain, was deserved. It was a fitting contest for Toronto’s first competitive match, and the game will be remembered as much for the effort of Siddal as it will for being the first game for this groundbreaking new club. Fittingly, the visiting side gave the Siddal team a guard of honour as they trudged off after the final whistle. “We had to fight really hard in an enclosed environment and didn’t get our noses in front until the very end,” Toronto director of rugby, Brian Noble, told The Mirror. “Siddal were magnificent and well organised, and I dare say other teams in our division would have been beaten here today. It was good for us to come out the other side of that. Everybody’s muddy in the changing rooms but they’re happy. Wolfpack coach Paul Rowley also had praise for Siddal, and was pleased with the way his side were able to overcome their tough amateur opponents. “It was a good game, an absolute battle between two even sides to be fair. Not just because of the conditions and atmosphere - but because Siddal are a good side. “We had our backs against the wall and were never going to be given anything - and rightly so. It was a great day for them and it’s kicked us off and running. This Challenge Cup win will serve the Wolfpack well in the months to come as they begin their League 1 campaign, and will have to endure many more games like this on their quest to reach the slightly brighter lights and greener pitches of Super League. All involved deserved a pat on the back after the game: the 1000 or so spectators in attendance, the BBC for showing the game worldwide, and the Siddal club for hosting a game which will go down not only in Toronto Wolfpack history, but in the history of the game full stop. The game can still be viewed via the BBC website here. This was no ordinary pre-season friendly. A scattering of fans in the east and west sides of Hull’s KCOM Stadium turned out for this historic occasion as a professional rugby league side from Canada played their first match in anger on English soil. The game was televised by Premier Sports, who will be showing Toronto Wolfpack’s league games throughout the season, but to show a friendly on top of this is an indication of the media’s commitment to this venture. The feedback from the rugby league community in general has been supportive. After yesterday’s game Hull coach Lee Radford and winger Mahe Fonua both had positive things to say about the venture. Radford was also impressed with the standard of his side’s opposition, and believes that they won’t be down in the lower divisions for too long. “At first view they should walk through that division,” said Radford. “I hope that they do and rugby league in Canada can take off. The game needs it. Toronto shocked the Challenge Cup holders by scoring the first try of the game through stand-off Blake Wallace. Their good field position was bolstered by a couple of penalties and their decision not to go for goal was rewarded with Wallace’s try — the club’s first ever — and was converted by captain, and former Hull player, Craig Hall. Hull — wearing their away jersey so the Wolfpack could don their home black shirts with white trim on their debut — responded with three tries of their own through Albert Kelly, Jamie Shaul, and Fonua, as the game appeared to be going the way many expected prior to kick-off. After all, this was a Super League side playing against a brand new team of players participating in their first game proper. What happened next was by far the most impressive aspect of the Wolfpack’s debut. At 16-6 down they were able to re-organise their defence which had become ragged, and add another weapon to their attack in the shape of Fuifui Moimoi who came off the bench to score. The 37-year-old Tongan born New Zealand international is a bustling presence up front, and he was able to power his way through the Hull defence to get the Wolfpack back into the game. As impact subs go, they don’t come much better than this. The ever-impressive Fonua was able to grab his second for the hosts to restore Hull’s lead, but by this time the game was an even, end-to-end contest. The half-time hooter sounded just after Toronto’s Bob Beswick had been held up over the line, with the scores at a respectable 20 points to 12. Hull made a number of changes at half time, introducing several youngsters into the fray, but their 13 was still one of quality. Despite this they only scored once more in the second half, as both sides improved on the defensive side of the game. Winger Jonny Pownall crossed in the corner just minutes into the second half to set the tone for the Wolfpack in this impressive second period. Less than ten minutes later Liam Kay was touching down on the opposite wing to level the scores at 20-all as Hall’s conversion from the touchline sailed just wide of the far post. Radford’s young team were able to mount som pressure towards the end of the second half but the Wolfpack looked like they would hold out. A good tackle from centre Greg Worthington kept the scores level, but his side went on to waste possession far too often. James Laithwaite entered the fray and made several good line-breaks, but understandable rustiness prevented the required ruthlessness in attacking areas. Hull may have allowed their opponents to wear their home jersey in their first outing, but they weren’t for allowing them a fairy-tale result. Wolfpack coach Paul Rowley was disappointed that his side couldn’t win the game, which speaks volumes of his ambitions for this team. "They probably had four key individuals that could add to that side, but we played Super League opposition today,” he said. “It certainly wasn't a reserve side, and we're disappointed we didn’t win the game. “I thought it gave us a good starting point for our review, and we can learn a lot. We had every single player on debut today, and you don’t see that too often. The fact that it was also a test for Hull ahead of their 2017 Super League campaign was testament to Rowley’s men. “I think we challenged Hull, and they'll have learnt things about their game,” added the Toronto coach, proud of his side’s first outing. They were supposed to have another friendly against Wigan at Manchester City’s academy stadium, but this was cancelled due to a change in the football club’s calendar. Rowley, however, believes his side can do without it. “We lost the Wigan game, but it suits me,” he said. “The key for us is staying healthy. I've seen enough that we can go into a competitive match, and to know that we can go against a competitive side. From Manfred Moore to Jarryd Hayne, and surprisingly little in-between, the history of football* and rugby league are intertwined, but both sports have so far failed to take advantage of the other’s athletes. These two codes of football grew from the same root and, perhaps with the exception of football’s quarterback position, require similar skill-sets. Hayne’s short-lived conversion to football, and stories that South Sydney Rabbitohs forward Tom Burgess has had a trials with the New York Giants and Buffalo Bills, suggest that the NFL might finally be latching on to this previously untapped talent factory. But could it work the other way? Rugby league thrives in its heartlands, but the problem is that these lands are few and far between. As a sport which has suffered at the hands of its Union cousin, and one which bafflingly fails to attract the media coverage of its rival code, league is still playing catchup, especially at international level, and especially since union went openly professional in 1995. A recent article on the Financial Times website suggested that rugby could capitalise on the NFL’s short season, and offer an alternative “tackle sport” in those empty months. But, though the article run with the headline “Rugby league goes after American football fans on their home turf”, the piece was about rugby union. While this is another example of the media’s ignorance of rugby league, the same reasons given for the potential success of rugby union in North America would also apply to rugby league. As the code which provides more continuous action, collisions, and running, as well as highly skilled kicking and ball handling, league could stand even more of a chance of success than its more confusing, sluggish, tactical based union cousin. North America could be an ideal launchpad for rugby league at an international level, creating a fourth and fifth team to challenge the big three of Australia, New Zealand, and England, but in order to to be successful across the pond from its birthplace, it might need a bit of help from football. Back in 1977, Manfred Moore discarded his protective equipment and travelled to Australia for a short-lived stint with the Newtown Jets. 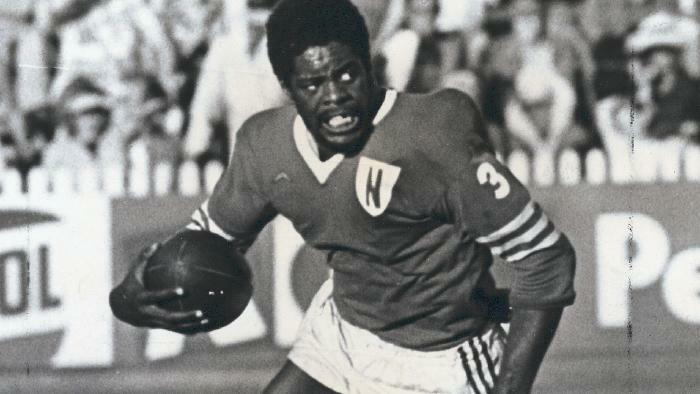 A year after winning the Super Bowl with the Oakland Raiders, he scored a try on his rugby debut in the New South Wales Rugby Football League premiership. “Newtown’s American gridiron import, Manfred Moore, proved an instant success in his side’s 17-10 win over West at Henson Park, scoring the first try of the match. Despite his promising start, Moore soon ended up in the reserves, and a cut to the head suffered while playing in the second row convinced him that the game wasn’t for him. Expecting more attentive treatment for his gash to the head, he was surprised that he only received stitches to the wound rather than something more substantial. If it is to work, it might be useful for each sport to understand the history of the other, and acknowledge the similarities which remain to this day. The game of football is omnipresent, and has been for some time. Throughout history the inhabitants of earth have found time to take part in games with balls, or spherical objects resembling a ball. From the beaches of New England and the open lands of the American northeast, to the villages and fields of old England, there are accounts of games of football being played stretching as far back as the 16th century, and you can bet that these games were played for centuries before this too. The codification of these games, which took place primarily in England in 19th century, has led to the several forms of football we know today, as each evolved into either the kicking game, or the handling game (sometimes known as the running game). In North America, teams in Canada developed a penchant for the running and passing game, and teams from Montreal especially played an important part in the transfer of rugby from England to the United States. Montreal Football Club were one of the earliest proponents of the running game. They formed in 1872 and played matches against teams from Quebec before the formation of the Quebec Rugby Football Union in 1883. Two years after the formation of Montreal FC, a game between McGill University of Montreal, and Harvard paved the way for football as it is now known in the US. Harvard were the renegades of early collegiate football, and continued to play under their own rules which involved carrying the ball. Their football was closer to the Boston Game which was similar to rugby, whereas most other colleges at the time played a game similar to association football, which had been abbreviated by the English to simply “soccer”. The origins of soccer in the US can be traced to a game between Princeton and Rutgers in 1869, but the origins of football stem from a combination of what is now known as Canadian football, and rugby. Harvard’s encounters with McGill University led them to find an opponent closer to home, Tufts University were the first, followed by rival university Yale, who stepped up in 1875 to play what is widely regarded as the first game of college football. It’s evident that football grew out of rugby rather than soccer, and the game we see today has similarities with both codes. The line of scrimmage is very union-esque, as is the use of a punt to gain territory, but there are even more similarities with rugby league. The limited number of “downs” a team gets in football mirrors the limited number of “tackles” a team gets during its period of possession in league, but in the latter game the count isn’t reset based on yards made. Walter Camp introduced the line of scrimmage, and sets of three downs to the rules of football in the 1880s, so it could be said that play-the-balls, introduced in 1906/07, and the four tackle rule introduced in 1966 were examples of rugby league borrowing from football. In league, a team will often kick on the last tackle and similarly a football team will often choose to punt. The skills required from those collecting the kicks are the same in both sports. If the teams are closer to goal by the time their final tackle or down comes around, then they’ll often try to score a drop-goal or field-goal. The phrase “field goal” is used in both sports, even though in football it takes the form of a place kick, rather than a drop-kick from open play as it is in rugby. A touchdown in football equates to a try in league (and actually has to be touched down! ), and place kicks are taken after the team crosses for a try in an attempt to add extra points — two in league and one in football. In rugby league this kick for extra points is taken in-line from where the try is scored, rather than automatically being taken in front of the goalposts as it is in football. The parallels between the two sports are there for all to see, and rugby league could soon catch on with North American sports fans if it receives a higher profile in the media, and more investment. The gap in the market for rugby league to eventually thrive in North America, could in turn benefit the game as a whole. New Zealand and Australia dominate the sport internationally. At club level the game down under is far superior to its European counterpart, and at international level the game struggles due to a lack of competition for the two antipodean nations. If the game can develop in the US and Canada, drawing on the skills of talented young athletes who will be more accustomed to this foreign game than they might initially believe, then this could add two quality international sides to compete with the aforementioned duo as well as the likes of England, France, and the Pacific Island nations. Organisations such as Pro Rugby USA in union, and now the Toronto Wolfpack in league, have begun making strides towards producing successful professional leagues and teams on the continent. These organisations see a chance to invest in a sport which could catch on in a country with a huge population of sports fans. The growth of rugby league in North America could be one of the best things to happen to the sport in decades, and it may also convert a few followers of what became America’s game into fans of the sport from which it originated. *The use of the word "football" in this article refers to the two forms of gridiron played in the USA and Canada. © torontofc.co.uk 2017. Awesome Inc. theme. Powered by Blogger.